High blood pressure – the term is also popularly known as the silent killer. Though it has no initial symptoms, but it can certainly lead to the long-tem complications and disease. There are a lot of individuals who have the problem of high blood pressure, but unfortunately they are not aware of it. And if we talk about the elementary complications of the poorly treated high blood pressure these are mainly because of the chronic damage that happen to the different organs in the body and involve congestive heart failure, heart attack, peripheral artery disease, kidney failure and more. Today high blood pressure is one of the leading causes of disability and death across the globe. No doubt, public awareness of such diseases has increased but still blood pressure is the topmost reason people visit the doctors. It is the way, the heart pump the blood into the arteries with lots of force to push the blood to every organ right from the top of the head to the bottom of the feat. Blood pressure can actually be defined as the pressure of the blood on the walls of the arteries when it circulates through the body. Blood pressure reaches the higher and then the highest points as it leave the heart through the aorta and then slowly decrease when it enters the smaller blood vessels. Blood return in the veins leading to the heart which is aided by the gravity as well as muscle contraction. It is uncontrolled high blood pressure which is actually responsible for a lot of cases of disability and death resulting from stroke, heart attack and the kidney failure. In fact the risk of dying of a heart stroke or heart attack is closely related to the high blood pressure specifically systolic hypertension. The higher is the blood pressure, higher is the risk. Thus it is important to control it in order to decrease the risk of heart stroke or heart attacks. However, there are some factors related to it that cannot be changed at all. Age: With increase in the age, the likelihood for developing the high blood pressure increases. This is mainly because of the arteriosclerosis or the hardening of the arteries. Race: It also depend a great degree on the race you belong to. 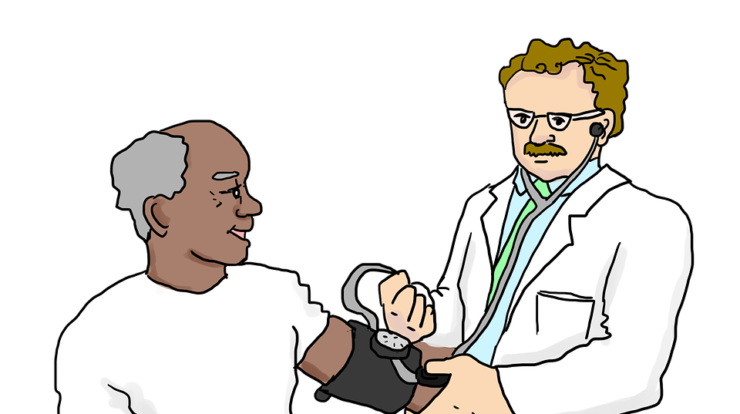 The Americans as well as Africans develop high blood pressure more often than any other race. In fact they develop it at a very young age and as a result experience more severe complications at an early age in life. Family History: It can be heredity also as there is tendency to have the high blood pressure in the family members. Socio Economic Type : High blood pressure is often experienced among the less educated and the lower economic groups. As people belonging to lower grades are hardly aware of the symptoms and its results ahead, they stay neglected while others stay concerned about it and look for the cure initially. Gender: Men often experience the threat of developing high blood pressure than women. This possibility differs depending on the age and among different ethnic groups. Obesity : With increase in the body weight, the blood pressure experiences a rise. Obesity can be defined as having the body mass index more than 3- kg/m. A BMI of 25-30 kg/m is taken as overweight. And when you are overweight it increases the risk of the high blood pressure. To the ones who are overweight it is recommended to lose weight and keep losing until they reach within the 15% of their healthy body weight. Sodium: Excessive or more than required use of sodium or salt also increases the risk of blood pressure. Reduce its intake and lower the risk of high blood pressure. Use of Alcohol: If you consume two or more than two drinks of alcohol per day you may experience this problem especially if you are sensitive to alcohol. Lack of exercise in Routine: Include some fitness exercises in your routine in order to maintain distance from this hypertension problem. Medications: There are certain medications that lead to this like diet pills, some medications used for allergy and cold. Avoid these or look for a perfect alternative. The high blood pressure is often labeled as the silent killer. People having high blood pressure actually do not know it until their blood pressure is measured. There are chances that people with markedly elevated blood pressure may develop the complications as organs are stressed when exposed to the elevated pressures. A high blood pressure patient may experience some very serious problems like kidney failure, heart attack, eye damage with progressive vision loss and more. It is actually very much important to understand that high blood pressure may remain unrecognized for years, while causing no symptoms but causing the progressive damage to the some particular organs, heart and the blood vessels. Hence whenever you see any single symptom or even if you do not see it, it is important that you go for regular blood pressure check up.